Two performances of "The Legend of Sleepy Hollow" on Wednesday, Oct. 17, will open the 2018-19 Children's Performing Arts Series at SFA. NACOGDOCHES, Texas - The Children's Performing Arts Series at Stephen F. Austin State University will open its 2018-19 season on Wednesday, Oct. 17, with two performances of the Virginia Repertory Theatre's "The Legend of Sleepy Hollow." Based on the classic story by Washington Irving, this musical version with book, music and lyrics by Paul Deiss takes audiences to Tarry Town to join Ichabod Crane, Brom Bones, the lovely Katrina Van Tassel and, of course, the Headless Horseman, as they live the story made famous by the legend. "This autumnal classic is faithful to the original story written in 1819 and will thrill and perhaps chill audiences," said Diane Peterson, SFA Fine Arts Box Office manager and director of the children's series. "But we promise it is not too scary for young audiences." 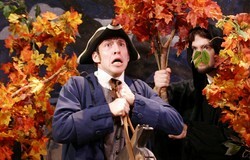 "The Legend of Sleepy Hollow" targets children in kindergarten through fifth grade. Performances are at 9:30 a.m. and 12:30 p.m. in W.M. Turner Auditorium, located in the Griffith Fine Arts Building on the SFA campus. Tickets are $7.50 for individuals and $6 per person for groups of 20 or more. Presented by the SFA College of Fine Arts, the Children's Performing Arts Series annually features five shows designed to entertain, educate and engage young audiences of all ages, according to Peterson. Study guides provide suggestions for pre- and post-performance activities and discussions for teachers to use in the classroom. A comprehensive study guide for "The Legend of Sleepy Hollow" may be accessed at cpas.sfasu.edu. Other upcoming CPAS performances include "'Twas the Night Before Christmas" on Tuesday, Nov. 27; "I Have a Dream" on Friday, Feb. 1; "Madeline and the Bad Hat" Wednesday, March 6; and "The Jungle Book" on Thursday, May 16.